Jingle bells at the ready it’s time to spread some Christmas cheer for seriously ill children. Post Pals has a few schemes this year which enable volunteers to be assigned a child to make smile. We break it down into 2 categories, Elf and Reindeer. Elves are assigned a child, the elf reads the child’s profile, selects some gifts and pops them in the post. These boxes bring great joy but don’t have to cost much, we recommend £15 although people are welcome to spend more or hunt out bargains! As an extension to this scheme we are also looking for volunteers to put a little gift box together for parents of seriously ill children and also a non religious one bereaved parents facing their first Christmas without their child. It’s hard to write with hooves so the reindeer need a volunteer to help send cards/letters. All 9 of the reindeer (Dasher, Dancer, Prancer, Vixen, Comet, Cupid, Donner, Blixen and Rudolph) send individual letters talking about life at the North Pole. Is the sleigh getting full? Are you training for the big night? What’s it like to fly around the whole world? Once we have enough reindeer we will also be asking for Mrs Claus to send letters too. Alternatively we welcome donations. We send helium balloons in the shape of a Christmas tree to decorate a child’s hospital room if they are in hospital in December and a hamper of goodies to families who are going to be inpatient on Christmas Day. 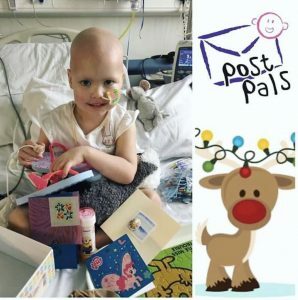 Any remaining donations will be used to bring smiles in January when all the excitement of Christmas has died down and the children are still in hospital. Donate through our Justgiving here. Our one request for signing up is please let us know if you can’t go through with sending the things you signed up to do. We know circumstances change but each year about 50% of the people who volunteer to be an elf are assigned a child and we never hear from them. It means some children in a family will receive gifts or letters and others won’t. Please let us know!